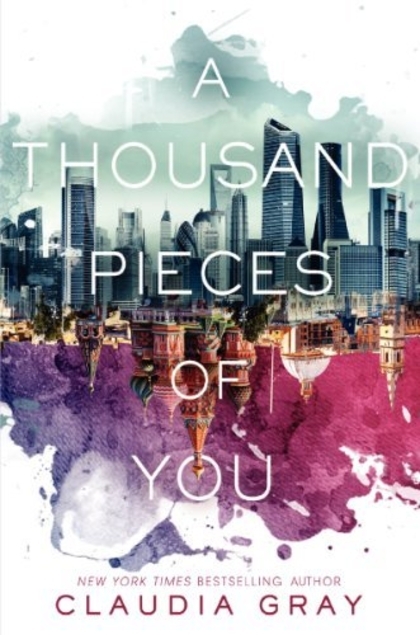 I crossed off another book for my goal to read more parallel-universe-stories this year with A Thousand Pieces of You by Claudia Gray. I madly love this premise (which is sort of a given with a reading goal this specific), and the book came close to living up to it! Marguerite has grown up surrounded by cutting-edge science and transdimensional theory. Her parents are the leading scientists on the theory, and their research assistants have always been like extra siblings…though eighteen-year-old Marguerite is kind of crushing on both current assistants, Theo and Paul. When Marguerite’s father is killed and Paul, apparently guilty of the murder, disappears between dimensions, Marguerite and Theo set off in pursuit. It doesn’t take long for Marguerite to realize that she doesn’t have the full story–and that she can’t be sure who to trust. This book is fantastic in some ways, a little disappointing in others. One small thing I love: Marguerite’s mother is the genius scientist. Her father too, but it’s clear he’s supporting her mother’s work, and there’s a lot about how smart her mom is without even a whisper of comment on her gender. Nice reversal of the gender stereotypes and normalizing women in science. On a larger thing, I love it that Marguerite is running through multiple dimensions and multiple versions of her life. When she enters a new dimension, she occupies the body of her other self in that dimension. She gets glimpses of who she is and what her life is like in very different worlds, which is fascinating. I loved everything about Marguerite exploring how her personality, interests and character changed in different worlds–and how the people she loves change (or stay the same) too. I was slightly disappointed that the major differences to her lives across the dimensions were never choices she made. It was always a wildly different world, or based on the choices of her parents. That was still interesting, but it did undercut her agency a little. She’s an extremely active character in the plot, but in the larger picture she’s fairly passive in how she’s shaped by each different universe. But I do love that we get to go to a number of different universes, a couple with more advanced technology, one that’s about a century behind. Marguerite visits worlds as different as a very high tech London and a seemingly Tsarist-era Russia (where she’s a Grand Duchess!) I bogged down slightly halfway through this book, when we spent a lot of time in Tsarist Russia. It wasn’t that it wasn’t interesting–it was that I was beginning to worry the book wouldn’t deliver on its promise of many universes. But we did eventually move on. I think we spent a long time in Russia for character and relationship reasons, which segues nicely into the next point about this book. I also worried around the same time that this was going to turn out less an adventure though dimensions and more a love triangle (and I like a good love triangle, but…adventure through dimensions!!!) It never quite did…although that’s definitely a key element too. Mostly it’s well-balanced–and a pretty good love story too! I liked the ethics questions raised too about occupying other selves’ bodies…although that was never quite explored or resolved as much as I would have hoped. That may actually be the sum of my feelings about this book. I liked what was here…but needed a little bit more to be able to really love it.